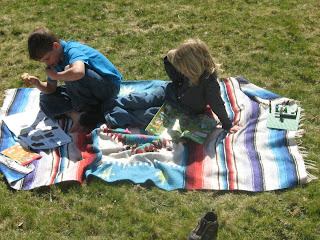 More friends and a blog: A Beautiful Day in the Neighborhood! Most of the time I don't think too much about how different my boys' lives are from those of most children in North America, but every once in a while it occurs to me how very lucky they are. Yesterday was warm and sunny...a beautiful kind of day that really let us know that Spring was here. Were my kids sitting in desks, only able to get a glimpse of this gorgeous day through the classroom window? No, they were not. This is how they decided to spend the day. They gathered sketch books, felts, magazines, books, Lego, a camera, carving knives, a tape player and a tape of The Tale of Despereaux and off they went to listen, build, carve, read, draw and photograph. They cracked walnuts for me and snacked on some. E picked a bouquet of violets for me. They had a wonderful afternoon. On days like this I feel so glad for them that they have this opportunity to be at home....to just be...at home. Aaaah, yes. THIS should be the poster-picture for "school at its finest"! Truly, inspiring. The Tale of Despereaux on tape? at the library? sign us up!! we love Despereaux! !